When il caffé began to perfume Venice’s streets, no one imagined this delicious aroma and flavour would become a referent of tutta l’Italia. The fact is, although the coffee grain does not grow in our land, we explored new methods of preparation to maximize its flavour and turn it into a sensorial ritual that has become an important part of our history. Maxespresso Gourmet Coffee was born with that passion, a Premium coffee inspired by a tradition that has awakened an entire country for hundreds of years. From this history we learned to commit ourselves to every detail of a 100% handmade process made in Italy, under the standards of the European community and that marks the identity of those who dream awake in search of becoming collectors of gourmet experiences. At Maxespresso Gourmet Coffee we summarize four centuries of history in the most exquisite taste. One of the secrets of our delicious taste is in the selection of coffee beans. At Maxespresso Gourmet Coffee, we have carefully studied and selected the most exquisite species on the planet, and although it has not been easy, we’ve chosen the best: Arabica and Robusta. Arabica coffee has a delicate aroma, and its flavour sums up the richness of the highland soil, giving a soft touch to the palate. The Robusta species comes to give us character. Its grains with greater concentration of caffeine create a greater body and an intense touch that activates the flavour of the mixture. 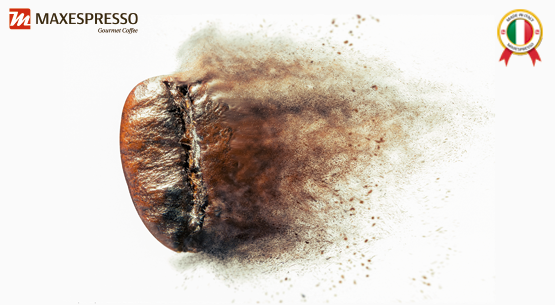 This balanced fusion, made 100% in Italy, makes us very proud and motivates us to continue to deliver our gourmet coffee, as a flavour experience to the most sophisticated tastes. We provide 100% recyclable packaging and capsules. We toast coffee with dedicated machines and without any manipulation of the product to create our Gourmet Coffee. We don´t use ingredients derived from genetically modified organisms (GMOs). With the same love and dedication that we make our products, we also keep them, protecting them hermetically from the sunlight. Maxespresso Gourmet Coffee uses the most advanced and modern packaging systems to preserve the quality of coffee, which maintains all its properties, making the consumer deserve a unique quality experience, enjoying our products that keep the entire aroma and flavour they had before leaving our motherhouse in Italy. We want all the properties of this wonderful coffee to remain intact when it reaches your hands, and that you feel the same quality, aroma and freshness that we enjoy during tutta nostra giornatta.